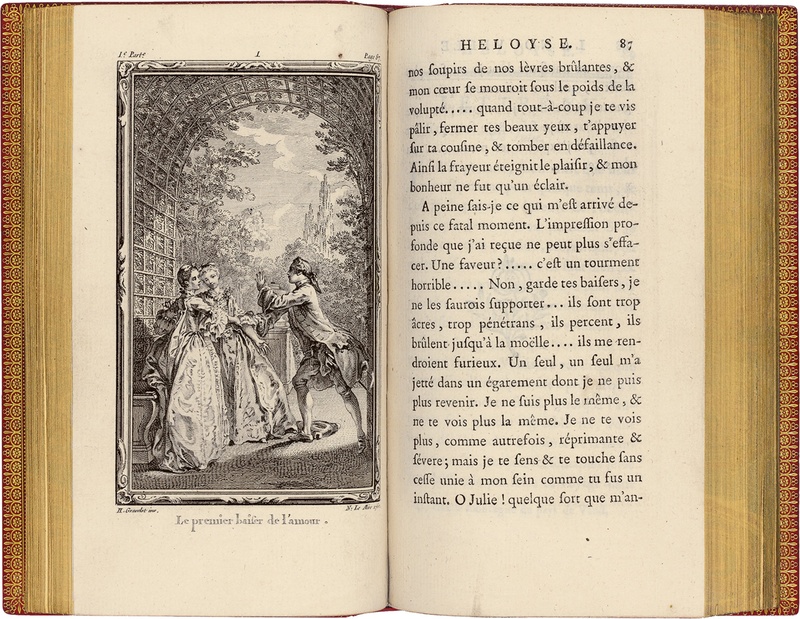 Superb leading copy from the first edition of the Correspondance by Flaubert Superb copy from the tirage de tête printed on Japanese paper from the first edition of the Correspondance by Flaubert Bound in full contemporary morocco by Huser with doublures. 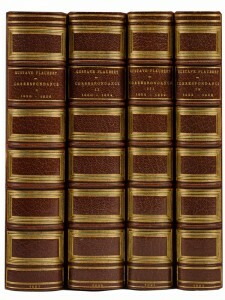 4 volumes [183 x 112 mm] in-12 of I/ (2) ll., xlii pp. (1) p., 348 pp. ; II/ (2) ll, 403 pp. ; III/ (2) ll., 408 pp., (1) l. of errata ; IV/ (2) ll., 395 pp. 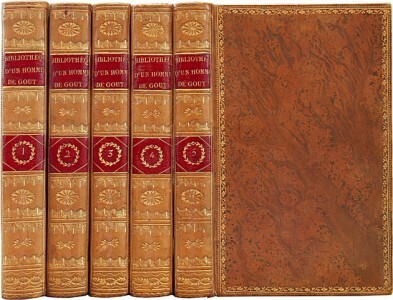 Light brown morocco, gilt fillets and green inlaid morocco borders on the covers, spine ribbed and decorated like the covers, green morocco doublures, light brown silk endleaves, gilt over untrimmed edges, wrappers and spine bound in. Binding signed by Huser. Issue: one of the 25 copies on Japanese paper. 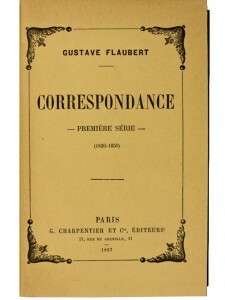 First editon from Gustave Flaubert’s correspondence. Talvart, VI, 10; Clouzot, 122; Vicaire, III, 735; Debacker, Auteurs du XIXe siècle, 2052. 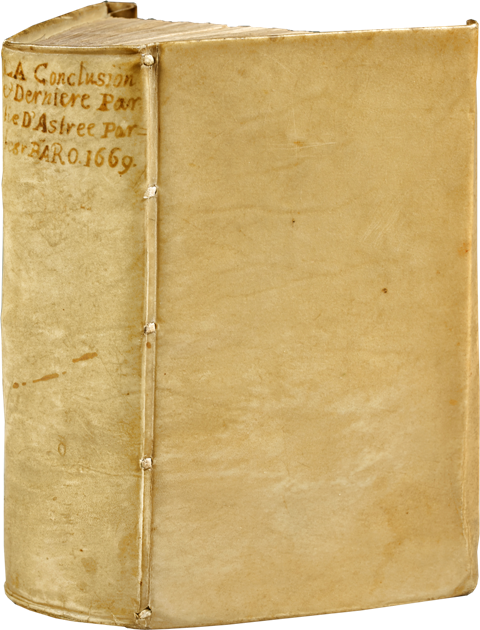 Leading copy, one of the 25 printed on Japanese paper, preserved in a contemporary binding with doublures signed by Huser. “This first edition of high bibliophilie reaches nowadays high prices when found on large paper: Japanese or Dutch paper. No issue on China paper.” (M. Clouzot). The “Correspondence” of the French writer Gustave Flaubert (1821-1880) is not of a lesser importance than his novels. 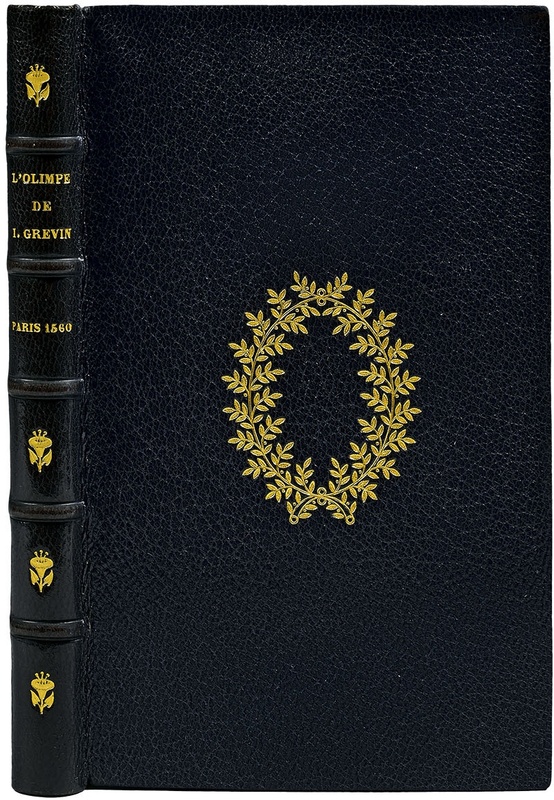 It was published, in four volumes, from 1887 to 1893, by Gustave Flaubert’s niece (1821-1880), Caroline Commainville. 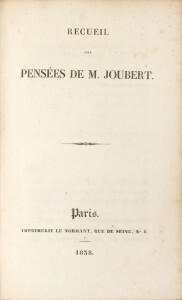 Raised by the author after her mother’s death, she will place before the letters according to her own “Intimate memories [Souvenirs intimes]”, offering us precious information about the man. “Towards 1885, a few years after my uncle’s death, M. E. Fasquelle told me that Mrs. Bissieu was offering him to publish Gustave Flaubert’s letters to my mother Mrs. Louise Colet. As an editor respectful of the rights of each one and as a devoted friend, he refused to do so and thought he had to warn me. 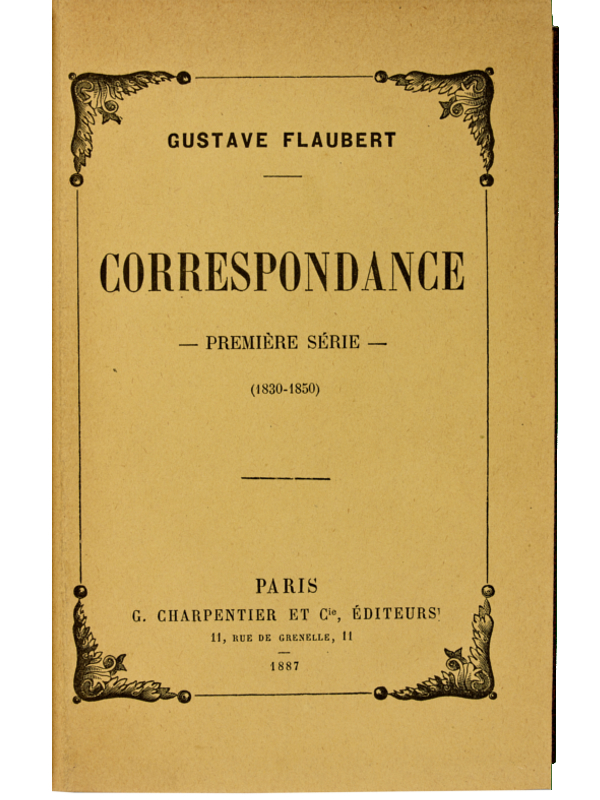 This fact was proving me that correspondence that I ignored was ready to appear and I was considering it as a danger; then my decision was made: I had to take the initiative, collect the letters written by Gustave Flaubert and if it was relevant, reveal them to the eyes of the public. 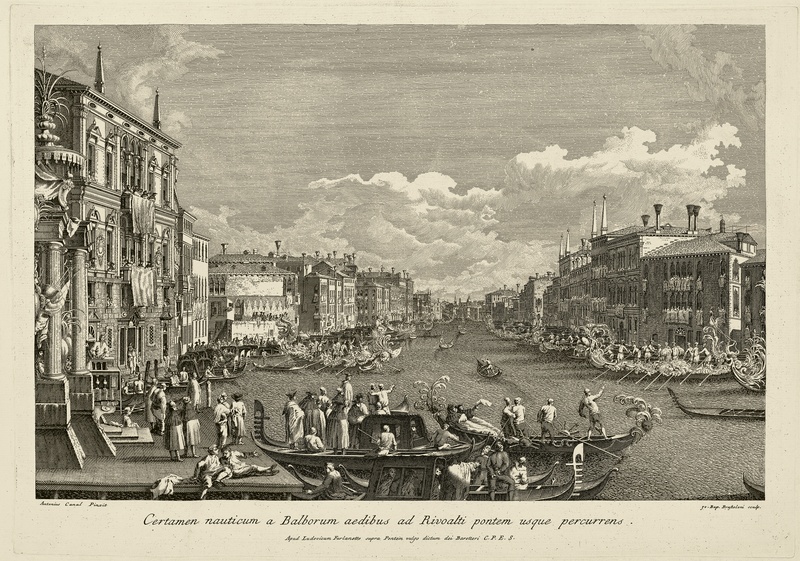 Who better than me, his adoptive daughter, could accomplish such a delicate task […]”. Caroline Commainville. “Here, Flaubert doesn’t try to make a work of art and his style is knocked, fast, violent, even sometimes gauche, but in the end, way more vivid and spontaneously colourful than the one of his novels.” (Dictionnaire des Œuvres, II, 104). 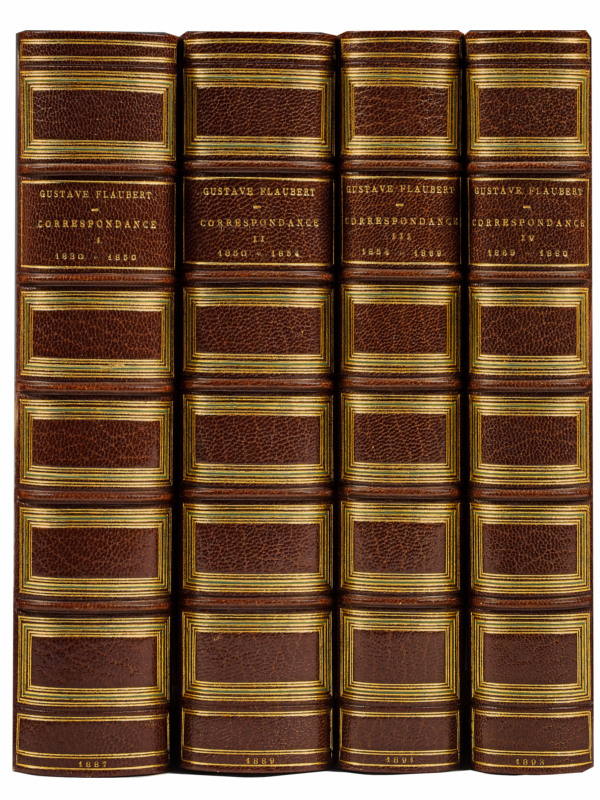 A magnificent copy preserved in its very elegant contemporary bindings in light brown morocco with doublures by Huser. Incredibly rare in this condition. Superb copy from the tirage de tête printed on Japanese paper from the first edition of the Correspondance by Flaubert Bound in full contemporary morocco by Huser with doublures.